This free crochet edging pattern was originally designed to go with a cotton openwork dishcloth pattern, and it works perfectly for that project. It also works for simpler dishcloths and can be used as a border for any square or rectangular crochet project. 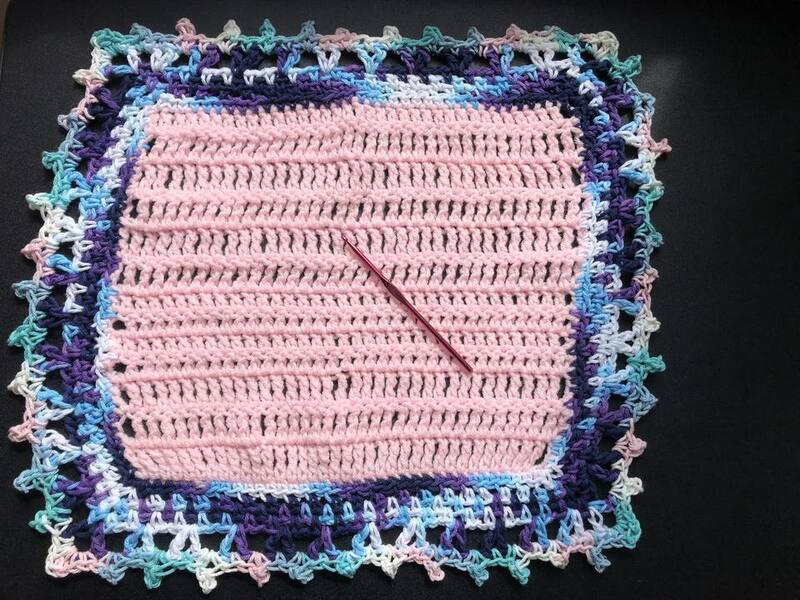 If you wish to begin with a simple crochet dishcloth, the ideal size for this project is 36 stitches square. That means that you will crochet 36 stitches across. The number of rows you crochet depends on the height of your stitches: 36 rows for single crochet, 18 rows for double crochet, 12 rows for treble crochet. Use the same yarn and crochet hook that you used for the body of the project. You can work the entire border in one color, change colors for the final round as shown in the tutorial or work every round in a new color. This tutorial shows two different variegated colorways of yarn worked with a size H crochet hook. The v-stitch is worked by making one double crochet, chain one and another double crochet all into the same stitch. 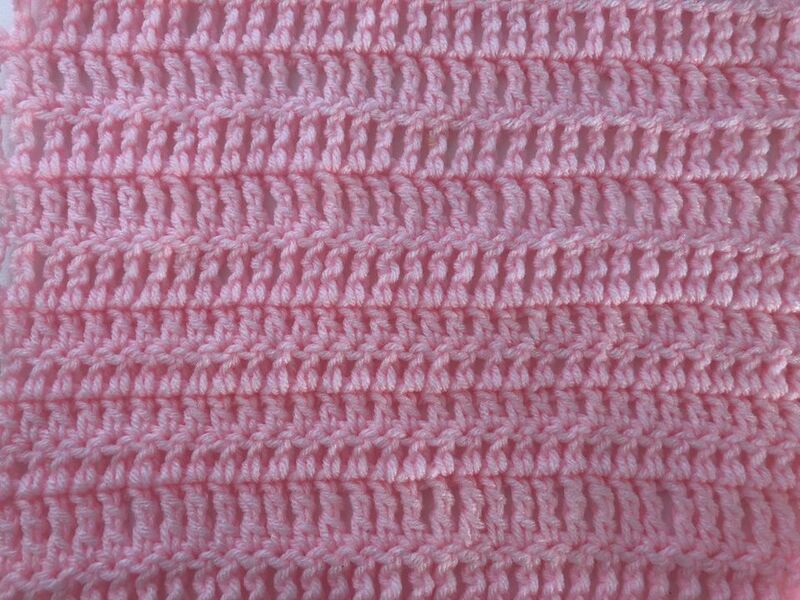 Note that you could turn this edging into more of a shell stitch by switching to a v-stitch crochet shell instead. The v's and picot stitches are used in the final two rounds of the crochet edging pattern. Join yarn in corner of work. Chain 2. Single crochet in each stitch across until you reach the corner. When you reach the corner, you will work sc, ch 2, sc into the corner. Continue to work around the entire project, with one sc in each stitch except for the corners, which are completed as above. When you get to the corner where you begin, work one sc into the corner, chain 1, and then slip stitch to the top of the first ch 2 to close the round. Note: For round 2 only, you will work in the back loop only all the way around. Chain two to begin round two. Single crochet in the next stitch. Chain 1, skip 1, single crochet in the next stitch. Repeat (ch 1, sk 1, sc) across row until you reach the corner. In the corners you will work the following: single crochet, chain 2, single crochet. Continue around the project, working the sides as in step 6 and the corners as indicated in this step. When you get to the corner where you begin, single crochet in that corner, chain 2 and slip stitch to the top of the chain 2 that began the round. Begin round 3 with a chain 3 in the corner. Skip the next stitch (which is a single crochet) and work a single crochet into the next space (the ch-1 space between single crochets from the row below). Chain one, single crochet into the next ch-1 space. When you get to the corners on round three, work one single crochet, chain two, one single crochet all into the corner. Continue around, working the edges of round three as described in step nine and the corners as described in this step. When you get to the corner where you began, single crochet in the corner then slip stitch to the top of the first chain 3. Single crochet into the chain space. In the last corner: sc, slip stitch to top of ch 3 to close round. This is where we start to work with the special stitches, beginning with v-stitch in this round. Remember that the v-stitch is worked by making 1 dc, ch 1, 1 dc all in the same stitch. Note: The v-sttiches in this round are worked into the chain-1 spaces of round 4. V-stitch in first ch-1 space. Repeat ( ) across row to corner. When you get to the corner, work the following all into the corner: double crochet, chain 3, double crochet. Continue around the project, working edges as described in step 12 and corners as described here. When you get to the final corner, make one double crochet in the corner, chain 3 and then slip stitch to the top of the first chain 3 to close the round. If you wish to make the final round of your crochet edging a second color then finish off at the end of round five and join a new color in the corner to begin round 6. If you wish to complete the project in a single color, skip this step and proceed to step 15. Round 6 is where we are going to use our other special stitch: picots. The picot is made by working sc, ch 3, sl st to 1st ch, sc all into the same space. But first, begin with a chain 2 in the corner (in your new yarn if you completed step 14). Work a picot into the first space. Single crochet into the next space (which is in the center of your v-stitch. The edges of round 6 will all be worked in the same repeating manner. Work picot stitches into each space between the v-stitches and work single crochet stitches into the spaces that are in the center of each v-stitch. Continue working round 6 in the pattern, completing edges as described in step 16. and corners as described in step 17. When you get to the final corner, you will work all of the steps of a regular corner, except do not complete the final single crochet. Instead, slip stitch into the top of the first chain 2 of the round to close the round.